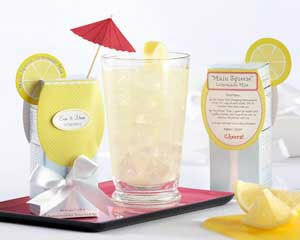 from Prelude to a Kiss Wedding Specialists' online store. 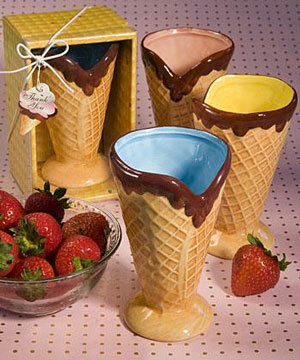 It may still be only January but we, like many Canadians, just can't get spring and summer off our minds. 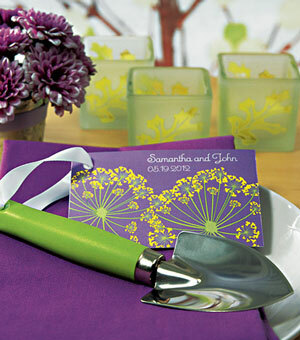 Luckily, your spring wedding is really just around the corner; so, let's take a short leap ahead and look at some ideas to get you thinking about your spring wedding favours..
Favours are a natural place to start talking about spring items for your wedding because they are a must have item and since favour options are virtually endless, there is always lots to talk about. 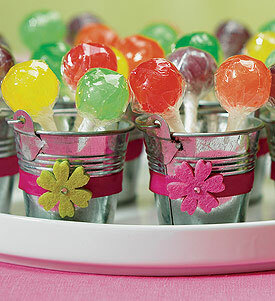 Also, favours often are helpful in adding an extra element of décor to your table setting, acting as part of the centerpiece or as the centerpiece itself. Mind you, regardless of how you choose to distribute or display your favours, spring, in all its glory, offers a launch pad of freshness and colour to all things wedding. "When trying to decide what type of favours you want to have at your wedding, it may help to break them down into categories and choose from there based on your wedding's overall theme or your personal style.".. 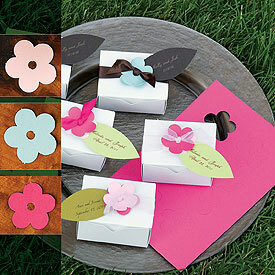 Since we are talking about spring favours, this is the logical first grouping. 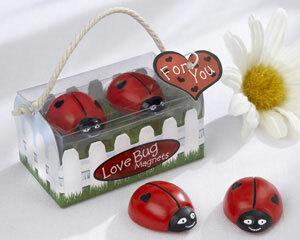 Choosing your favours based on season is an easy way to find the perfect item. 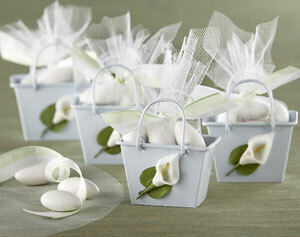 Flowers, sunshine, and longer days are all things synonymous with spring..
source: Winding Road Weddings, in Guelph ON. 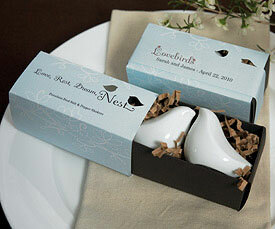 Love Bird Salt & Pepper Shakers, from Prelude to a Kiss Wedding Specialists. 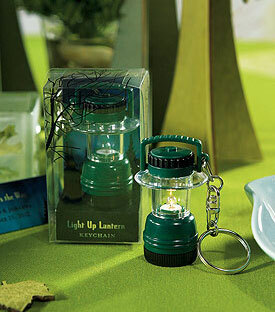 Candles are always an excellent choice for favours. 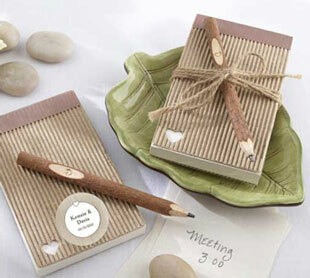 They are a useful item that can be used by your guests after the wedding. 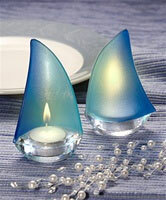 They can also adorn your table or can be used throughout the night as part of your centerpiece. 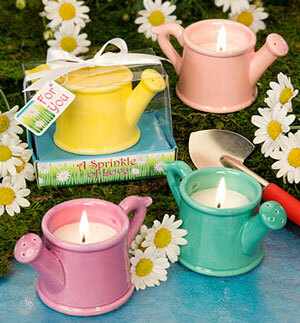 Find candles that also represent spring and you have found the perfect favours for a spring wedding! 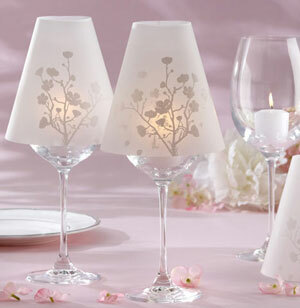 "Cherry Blossoms" Vellum Wine Glass Shades by Bridalicious! 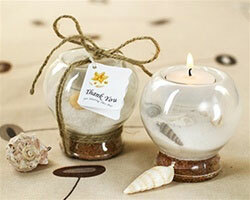 A different style container: Favor Jars, also from Creative Expressions Accessories. 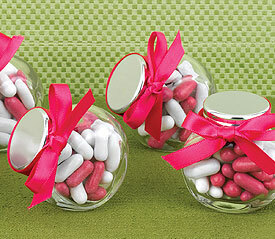 Favours are a great way to add personality and style to your wedding. If you are at a complete loss as to what type of favours would be best, you have to look no further than to nature itself. 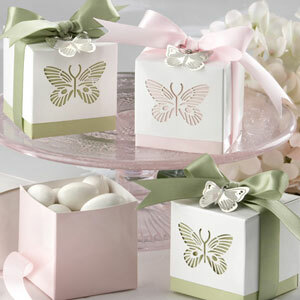 For a spring wedding, nature dictates with fresh blooms, beautiful scents, and bright sunny days. Take notice and let your surroundings guide you; you can't possibly go wrong!